Manish Arora, master of psychedelic streetwear, apparently discovered bronyism for Spring 2017, because the entire collection he showed in Paris Thursday was centered on the ever-beloved My Little Pony, appended with the hashtag #manisaroralovesmylittlepony. And it must have been official, too, because his kooky doll approach got the cosign both with Ponies on the clothes and Ponies for every attendee. But as true bronies know, it’s not just a fanaticism but a life philosophy, and Arora’s array of multicolored, shiny-happy skirts (he played that song, by the way) and rainbow-powered creepers reflected that as only his groovy mind could conjure. Hair was pouffed into horse-and-poodle manes to compliment the iridescent and crystalline elements that covered everything—including a skirt that read “Life is Beautiful” with a freaking rainbow on it. In a year like this one that could be read as irony, and yet Arora surely meant it more as escapism and an affirmation of the ever-loving values that Pony fans hold dear. Embroidered denim projected the notion of new-age Nudie suits, offset with cute themed dickies with hearts and anchors. Also, for some reason smack in the middle of the runway, he sent down a model dressed in head-to-toe latex, a living doll. 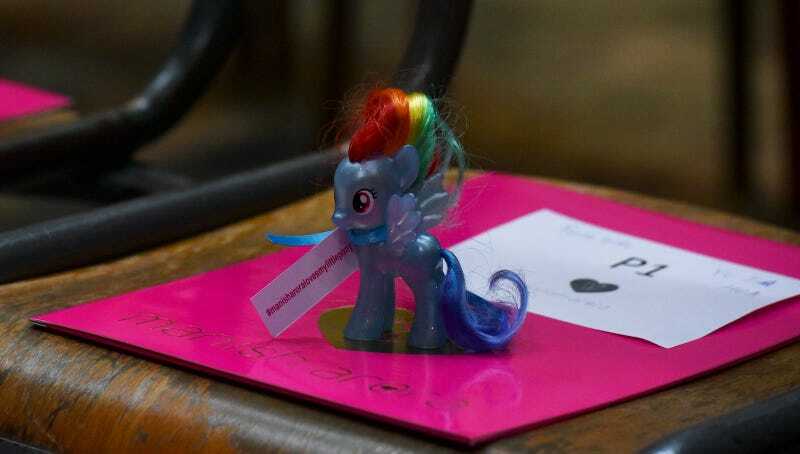 Perhaps that was a shout out to the My Little Pony fetishists? Hey, who says alternative sexual turn-ons shouldn’t be a part of fashion, too. I want those shoes. And in the interest of dolly inclusion, models ranged from your standard-fare runway ladies to drag queens to older and average-sized women of a variety of ethnicities—because if I know one thing about the Pony universe from watching like nine documentaries about it, it’s all about inclusion. Friendship is magic! Birds chirped in the distance, and yet with all the surface brightness it also alluded to new wave and goth, too, asserting that perhaps your inside feelings could match the enthusiasm of your garments, if you try. It’s like The Secret of dressing.